Have you ever made a recipe, and then were pleasantly surprised by not only how beautiful it looked . . . but by how amazing it tasted?!!!! Beautiful, even while still in the springform pan! A few years ago, I was sitting around at my parent's home going through cookbooks, jotting down recipes that looked promising . . . It was during one of those times that I found this Uptown Banana Pudding Cheesecake recipe in a Taste of Home Cookbook. It sat in my recipe box for at least 2 years before I finally made it. 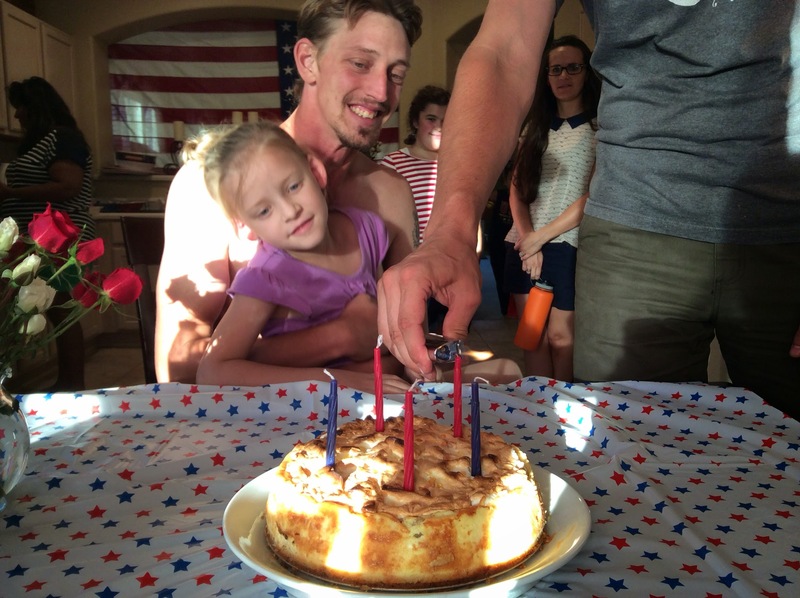 Will loves banana cream pie and cheese cake, so, this is a perfect mix of two favorites! Cheese cake is decatant on it's own . 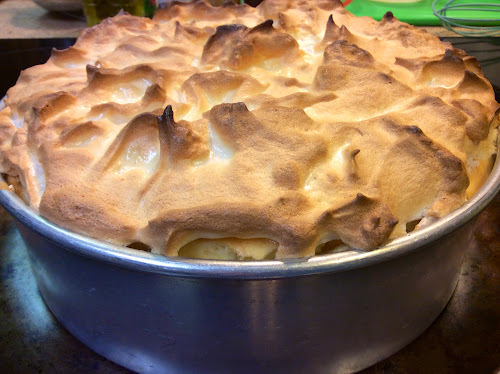 . . Add a beautiful meringue topper, and you have an upscale "Uptown" version . . . Perfect for birthday, and Easter and Christmas celebrations! UPTOWN BANANNA PUDDING CHEESECAKE - a real show stopper! Tip: For maximum volume from egg whites, separate the eggs while cold, and then let whites sit at room temp. 20-minutes before whipping them. Use a glass bowl, making sure it is clean and grease free. 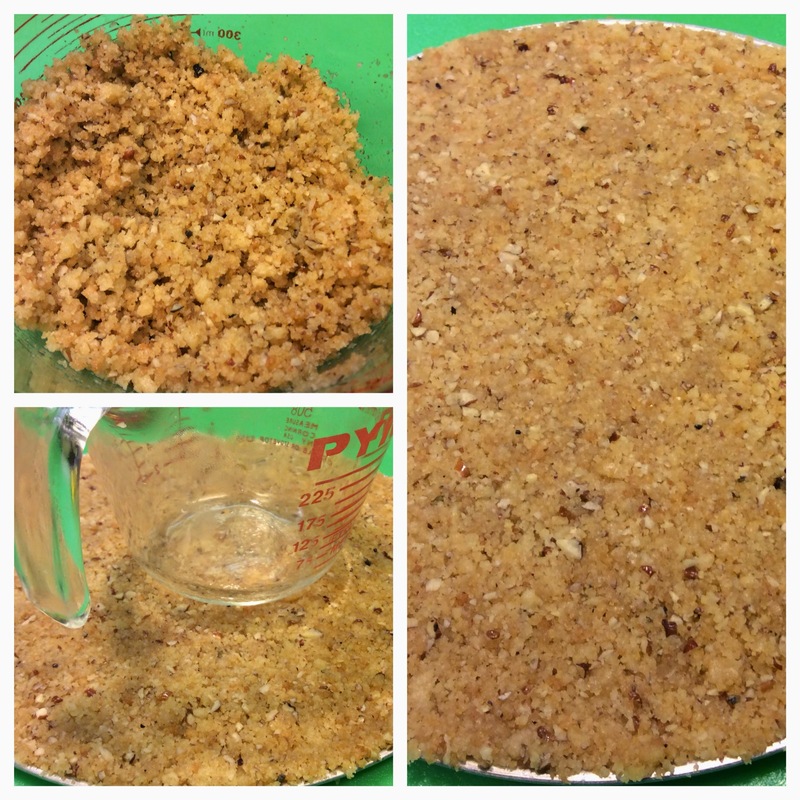 For crust ~ Combine first 3 ingredients in a bowl, and press in bottom of a greased 9-inch springform pan. I use the bottom of a 1-cup glass measure to get a good tight crust. Bake crust at 350° F. for 10 minutes; cool on wire rack. Combine diced bananas and 1 tablespoon lemon juice in a small saucepan. 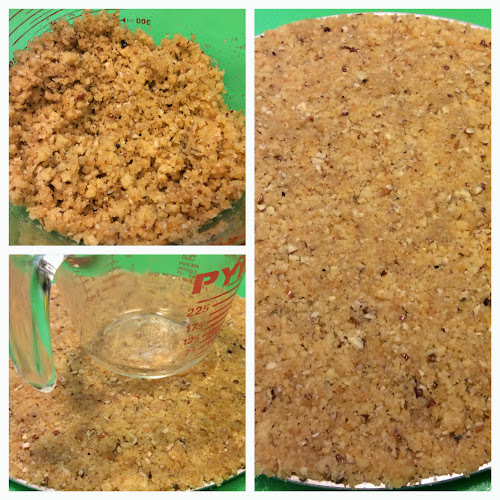 Stir in 2 tablespoons brown sugar. Place saucepan over med-high heat and cook, stirring constantly, about 1 minute . . . Just until sugar has melted. Set banana mixture aside. In a large bowl ~ Beat cream cheese at medium speed w/an electric mixer 3-minutes, til smooth. Gradually add 1 cup of sugar (1/3- cup at a time) beating til blended. Add eggs, 1 at a time, beating til blended after each addition. Beat in liqueur and vanilla. Pour cream cheese mixture into locked springform pan (crust already baked). 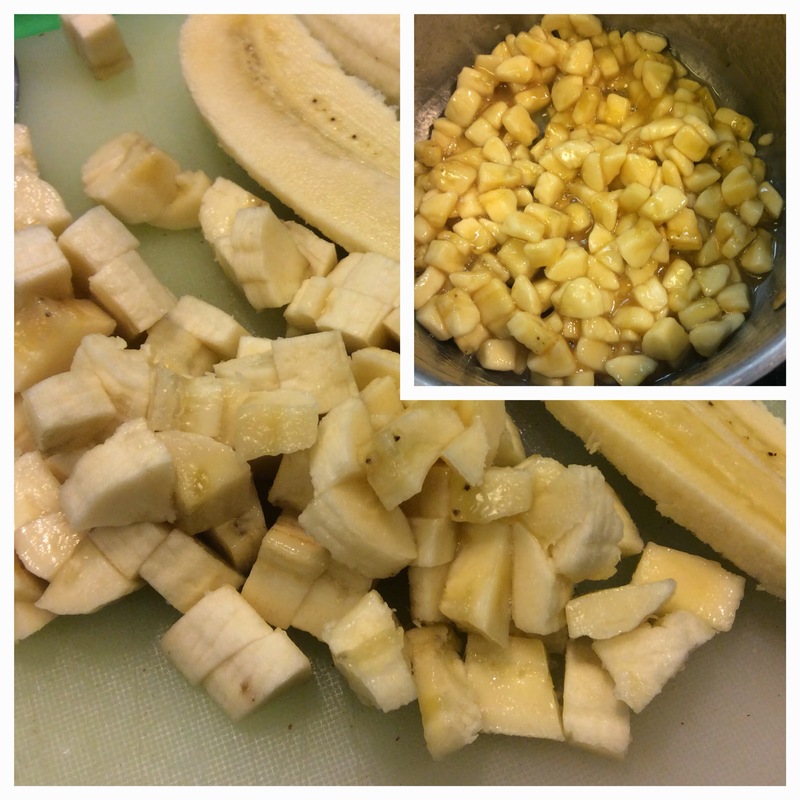 Spoon banana mixture, evenly over the top, swirl gently into batter with a knife. Meanwhile, make meringue. Beat egg whites and salt at high speed with an electric mixer until foamy. Add 6-tablespoons of sugar, 1-tablespoon at a time, beating until stiff peaks form, and sugar dissolves (about 1-2 minutes). 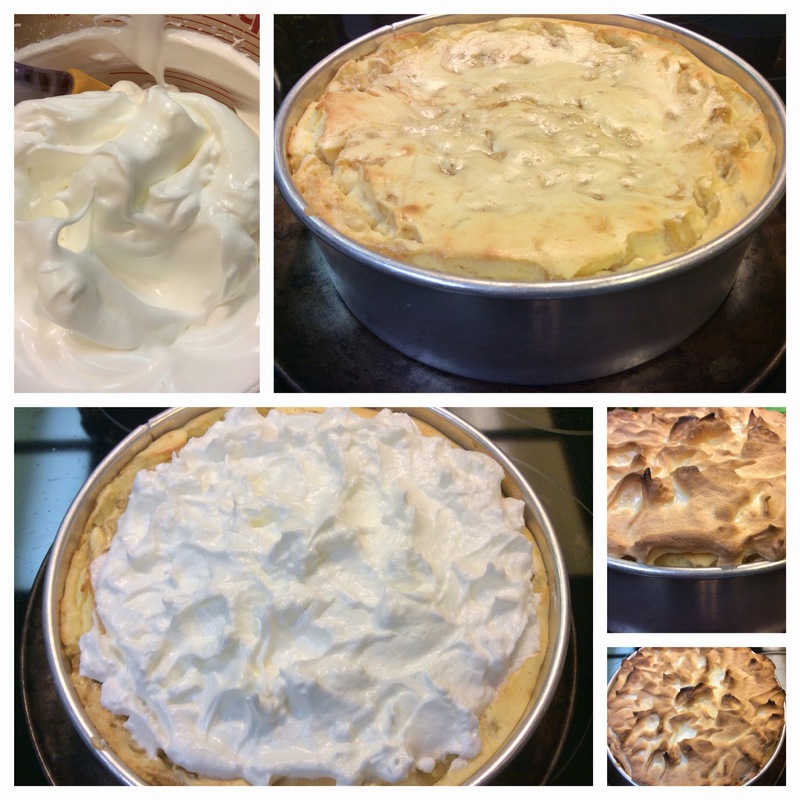 Drop spoonsful of meringue gently and evenly over hot cheesecake, putting only on the cream cheese mixture. 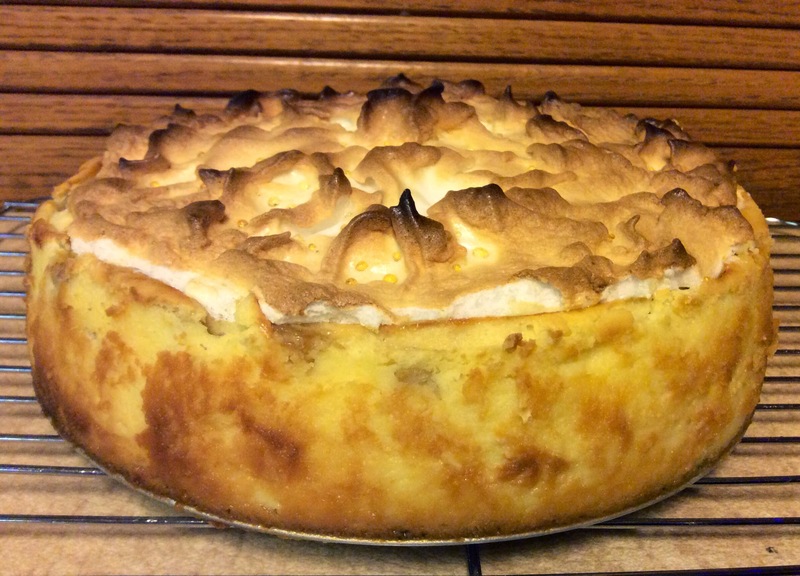 Bake for 8-10 minutes, or until meringue is golden brown. Remove cheesecake from oven; run a knife around the edge of cheesecake in springform pan to loosen. Cool cheesecake completely on a wire rack; use plain wooden toothpicks to hold plastic wrap above the meringue; wrap loosely with plastic wrap. Keeping cheesecake in springform pan. Cool for 8-hours in refrigerator until ready to serve. Chop bananas; cook in small saucepan with lemon juice and brown sugar. Preparing cream-cheese mixture for baking. Apply meringue to hot baked cheesecake, baking until golden brown. 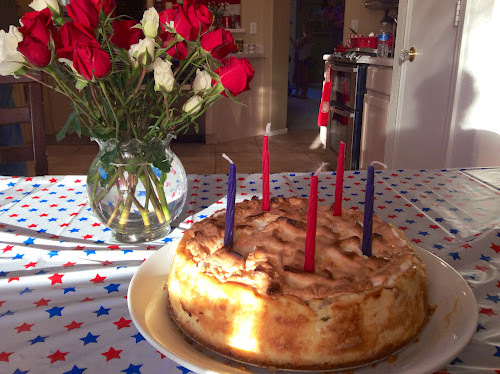 Our youngest, Matthew asked for cheesecake this year for his birthday . . . Happy 30th Baby! Photo of son Matthew, and Grands - Emmy and Matty. So, while this cheesecake looks elegant, and tastes incredible, it really is not that difficult to make! Friends and family use these words to describe it . . . Awesome, amazing, incredible, WOW! 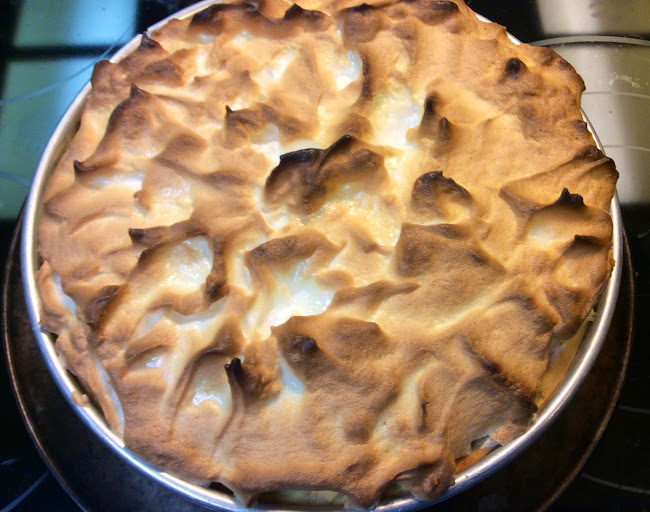 This is how I describe it ~ The meringue tastes like a campfire-roasted marshmallow. 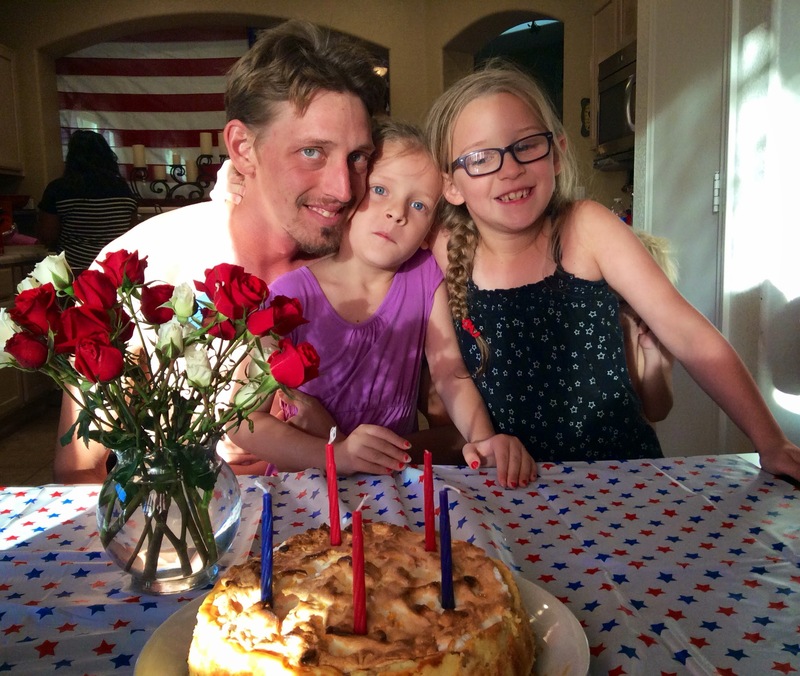 A crust, made from Nilla wafers, and walnuts? . . . Oh Momma! It will make a plain graham cracker crust blush in shame! 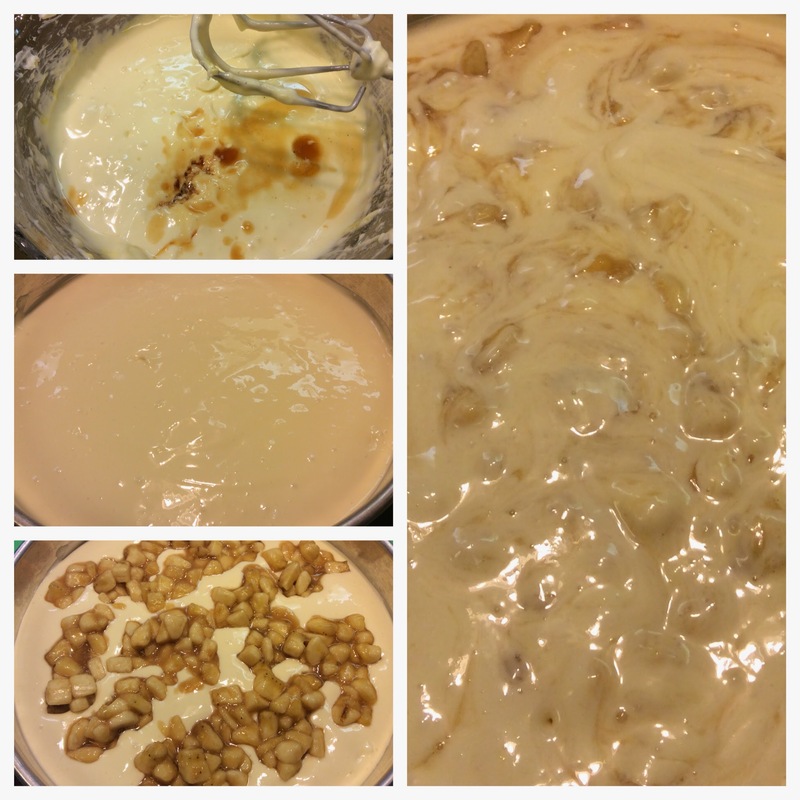 Cream-cheese filling, fresh eggs, sweetened, and laced with sweet brown-sugared bananas, pure vanilla extract and the entense coffee bean flavor of coffee liqueur. Yes, this is not your typical cheesecake, and you will find it here during special celebrations . . . Over at Julie's!! !